To get your purchase research started, lets take a look at the features you should be considering. All great portable table saws will have at least some of these features. To get the best deal for your money, you’ll first have to consider what your needs are going to be. To make things easier, try making a checklist of features you know you’ll need, then try and find a saw that adheres to these specifications. Now, here are the features you should be looking for in a portable table saw. The best portable table saws are in the 15 amp class. This amperage seems to offer the best power delivery and bang for your buck. 15 amps is plenty of power to get through tough materials without overloading the saw. The three products we have listed in this article are all in the 15 amp amperage class. 3,500 to 5,000 RPM is an effective RPM range for making the best cuts through the widest range of materials. We think you’ll find this RPM range to be the “sweet spot” of cutting and provide you with the best cutting experience. Most portable table saws come with electric brakes to help increase productivity. Electric brakes will stop the blade from spinning automatically, preventing the need for you to stop it manually. Many portable table saws feature carrying handles that make transporting the saw easy. You can carry it upstairs, downstairs, and even load it up into a vehicle. Carrying handles are a great feature in portable saws. A portable saw should be lightweight enough to transport the unit to anywhere you’d like. Portable saws vary greatly in weight. Some are under 100 lbs, while others are around 50 lbs. Generally, the heavier the weight, the more durable it is, but the added weight may prevent you from transporting the saw anywhere you’d like. Being able to make adjustments to the saw without having to use tools is a valuable feature. Not having to have tools close by to make adjustments will allow you to make all your adjustments on the fly. It’s a good feature to look for. 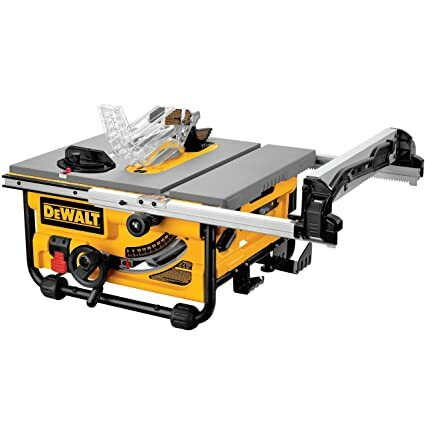 Some of the best manufacturers of portable table saws these days are DeWalt, Makita, Bosch, Black and Decker, Ryobi, and SKIL. You can find proof that these are the very best companies through the review section of Amazon. Many people are listing their positive experiences with this company and you can too! Most products that are worth buying will have at least a one year warranty with them. Some come with a generous three year warranty, but you’ll have to look at the specifics of the product to be sure. They’ll also allow you to send the product back within 30 days if it’s defective. Even the best products on the market are prone to failure from time to time. It’s best to arm yourself with a warranty to stay financially safe.